Before the viewer, the same distant view of the two-headed Pukubayama mountain unfolds, but somewhat from a different angle. Hiroshige portrayed another Asukayama slope, where the ancient Shinto shrine of Lodzi Inariddzinja was located, part of the main building of which, sinden, is visible in the engraving on the right. In Edo, there were many temples dedicated to the Shinto deity Inari, initially patronizing agriculture. Later it was a rethinking as a deity, bringing good luck in crafts, commerce and giving prosperity. With the god Inari, a fox cult is associated, which was considered his messenger or even incarnation. According to legend, on the eve of the new year, foxes from all over the region gathered in this main sanctuary in the Kanto area. Usually the Inari sanctuaries were arranged in the forest or in the hills, away from home. The Inari sanctuary is also located near the village of Lodz, whose roofs turn yellow in the background of the engraving. From the gate of the torii on the stairs people rise – to pray for prosperity in the New Year. Flowers on plum trees, behind the houses of the village of Lodz, mark the early spring. Late version of the engraving has a darker color. This is promoted by the almost black crowns of the depicted pines, with which the silhouette of Mount Tsukuba, which is visible on the horizon, harmonizes. The green strip on the first variant also acquires a darker shade. 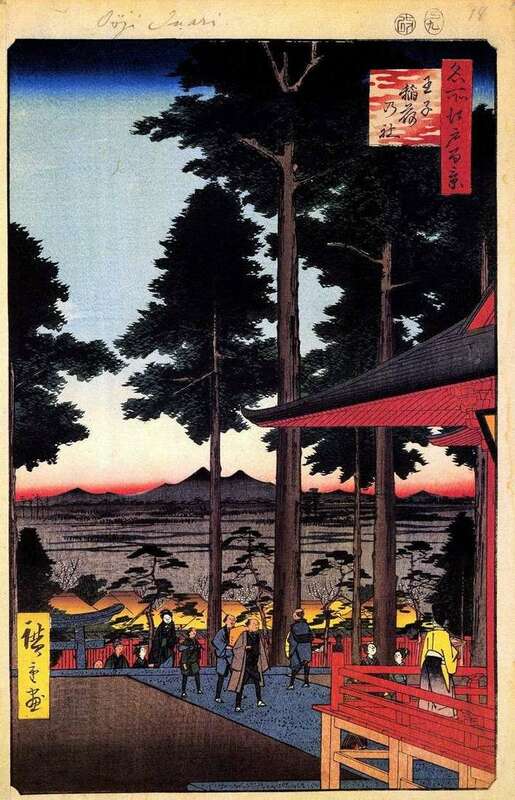 Description and meaning of the painting Inari Sanctuary in Ouji by Utagawa Hiroshige.